We had recently engaged Rebecca for a family shoot at our bush home in Cooroibah. One particular shot of the full group taken across water was a stand-out. Picking up reflections in the water is a special kind of skill, not as easily achieved as one may suspect. 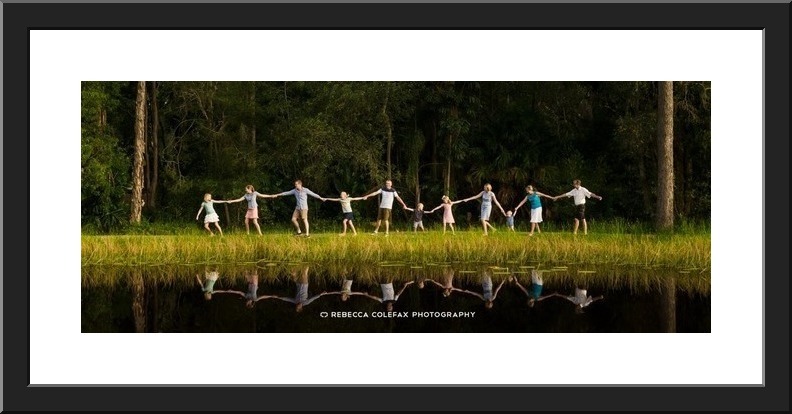 After having it framed and presented to mum, I recalled a happy snap I’d taken of my husband’s side of the family on a previous family holiday, also showing reflections across the water. I asked Rebecca if she could clean up my image and organise framing through her contacts. What a legend!! The woman is pure magic, all heart, truly professional and talented beyond description. Rebecca has a consistent genius that she brings and astounds us with something new at every photoshoot. I shout her name from the rooftops any time I’m asked for a recommendation! If you feel a connection with my work, would like to enquire about my services or make a booking please contact me using the form below.